Maybe you have seen one -- leaping high above a telephone pole and fluttering white-banded wings to get your attention. Perhaps you have heard one -- on a warm moonlight night singing a symphony of up to 40 different imitated calls, delivered in beautiful, rapid succession. Or maybe one has unexpectedly whacked you in the back of the head -- punishment for accidentally venturing too close to a nest. In fact, if you live anywhere in North America, you have probably made the acquaintance of a Mockingbird. And quite likely, the bird knows you too. In an experiment that could be repeated in almost any American back yard, Douglas Levey (et al) grabbed headlines by showing Mockingbirds can distinguish between human individuals, and will attack persons they recognize as threatening -- while ignoring others they have decided are harmless. The birds recognize and remember people based upon as few as two encounters that can last less than 30 seconds. Brain studies have long suggested Mockingbirds are unusually bright. But why do they imitate other birds? Because they direct their calls into (rather than out of) their territories, their calls probably function more to attract females than to ward off other males. Experiments using recorded Mockingbirds have shown the songs can stimulate nest-building behavior, and that the calls are good enough to fool other species. 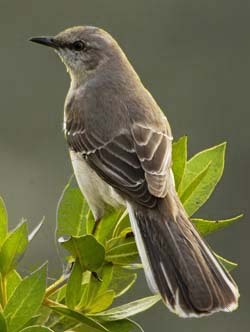 But experts remain stumped on why Mockingbirds prefer to imitate others, rather than create their own songs. Can you design an experiment to solve the mystery of the Mockingbird? One may be perched outside your window right now -- ready to start a conversation. I am confident that it is the same bird, and that this Mockingbird has for some reason developed an obsession with your house. I had a similar problem with a Cardinal that persisted in banging on my bedroom windows, making it impossible to sleep during the day. At first I thought he was fighting his reflection, but I noticed that he would often perch on the sill and look inside at me. This happened for years until I finally put up screens, and was finally able to get some sleep. Many birds -- especially woodpeckers -- like to bang on windows since it makes a lot of noise, and advertises their presence. However, it is sometimes hard to figure out exactly what birds are thinking -- one thing that makes them more interesting!